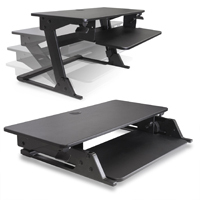 The RELEVATE Manual Height Adjustable Desk Base from iMovR is a sturdy, hand-cranked desk unit made for lifting 200 lbs of weight from 29" to 48" in height (not including tabletop). The RELEVATE has an infinitely adjustable width range between 32.75" to 53" (measured between the legs), which can accommodate tabletop sizes from 42" and 72" in width and 24" to 36" in depth. Lift speed is three turns per inch. RELEVATE frames can be conveniently paired with the ThermoDesk ELLURE or Omega Denali Thermdesk premium 1.125" thick 3D-laminated tabletops, which are pre-drilled to fit the RELEVATE frames and equipped with threaded metal inserts, ensuring quick and easy assembly. 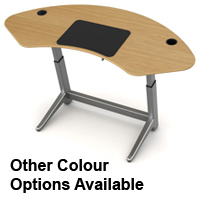 As well, existing or custom-built tops can easily be attached using the mounting holes on the RELEVATE frames. 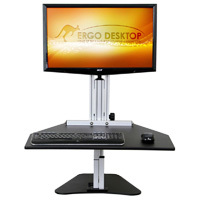 The Freedom Desk from Ergotech Group converts any sitting desk into a versatile sit-stand desk with ample workspace (up to 2 monitors), including a separate lower keyboard and mousing area. 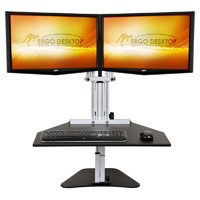 This freestanding unit has a spring-assisted lift mechanism for effortlessly moving monitors, work documents, keyboard, and mouse into 10 different height positions up to 14.5" above the worksurface it is placed upon. 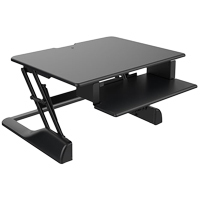 Holding up to 35 lbs of weight, the lift strength of the Freedom Desk can also be finely adjusted so that it keeps any devices on the desk safe and sturdy whether moving up or down. In addition, a simple single-handed release mechanism offers almost effortless height adjustment. 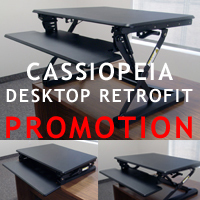 The Altissimo-Plus from KV Waterloo is an all-in-one solution for converting a sitting desk into a sit-to-stand desk. 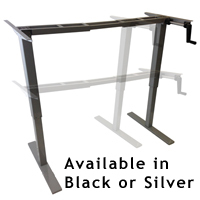 Mounted at the back, side or corner of the desk, this space-saving workstation effortlessly moves up or down using a gas spring mechanism and is easily stored when not in use. 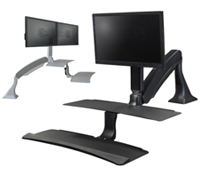 The Single Workstation (6032 Series) accommodates monitors from 5 to 20 lbs, while the Dual Workstation (6042 Series) handles monitors up to 8 lbs each and 24" wide (diagonally). 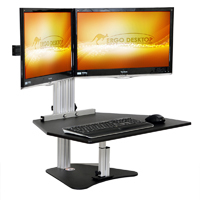 Like the original Altissimo model, the height range of the Altissimo-Plus is an impressive 22" with the keyboard tray ranging from 5" below desk height to 17" above the desk. The monitor has an additional 8.3" of independent adjustment and can be tilted to 45° or rotated 90° from landscape to portrait orientation. 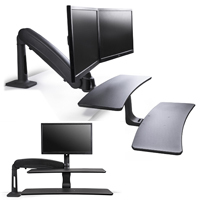 In addition, the monitor tower can rotate independently of the worksurface 180° from left to right. The keyboard tray of the Altissimo-Plus is made of MDF (unlike the all-metal tray on the Altissimo) and is angle adjustable with 15° of negative incline and 4° of positive incline, while also being height adjustable relative to the upper platform (also made of MDF). All these adjustable ranges make the Altissimo-Plus a slightly less versatile sibling to the Altissimo.